Nasri, S. (2015). Effect of group social-cognitive skills training on aggression and social desirability of preschool children. International Journal of Behavioral Sciences, 9(1), 19-26. Shaghayegh Nasri. "Effect of group social-cognitive skills training on aggression and social desirability of preschool children". 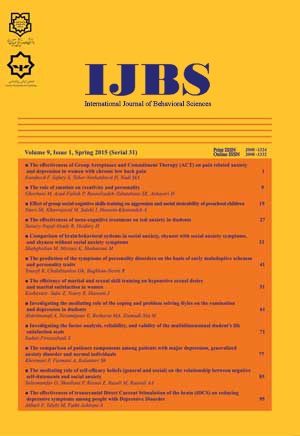 International Journal of Behavioral Sciences, 9, 1, 2015, 19-26. Nasri, S. (2015). 'Effect of group social-cognitive skills training on aggression and social desirability of preschool children', International Journal of Behavioral Sciences, 9(1), pp. 19-26. Nasri, S. Effect of group social-cognitive skills training on aggression and social desirability of preschool children. International Journal of Behavioral Sciences, 2015; 9(1): 19-26. Introduction: Aggression in childhood may lead to delinquent behavior's in adolescence and antisocial behavior's in adulthood. The present study was designed to investigate the effectiveness of social –cognitive skills training on aggression and social desirability of preschool children.Method: This research was an experimental research and conducted with pre-posttest design with control group. The statistical population of this study consisted of all preschool boys children's in Bandar Anzali city in 2013-2014 academic years. The sample of this research were 24 preschool children who were selected by random cluster sampling and were randomly divided into control and experimental group. The data collected with the Preschool Aggression Questionnaire and Social Desirability Questionnaire. Social-Cognitive Skills (Ladd & Mize Model 1983) were training on children experimental group in 12 sessions.Results: The results of analysis of covariance showed that the social-cognitive skills training resulted in a significant decrease in total score and subscales of aggression. Morever the results show a significant increase in social desirability in the experimental group compared with the control group.Conclusion: Given that aggressive children have low social desirability, it seems that the training of social –cognitive skills by increase skills such as cooperation, participation, helping others and taking-turns, will lead to social desirability and decrease aggression.